For those of you enjoying live football draft parties it's time to step it up a notch. Hooters is making it really hard to ignore them this fantasy season. 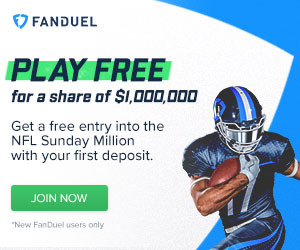 They're giving away a ton of swag and going out of their way to make your live fantasy football draft a memorable experience. I've hosted live draft parties in the past, they're a blast. I've also hosted live draft parties at venues that welcome that kind of stuff and the experience was multiplied. Food and drink being brought to you during the draft is a nice perk, not to mention everything they throw on top of it. Consider reading the press release below for all the details. Hooters invites fantasy football leagues across the nation to book their VIP draft parties by visiting hooters.com/football. 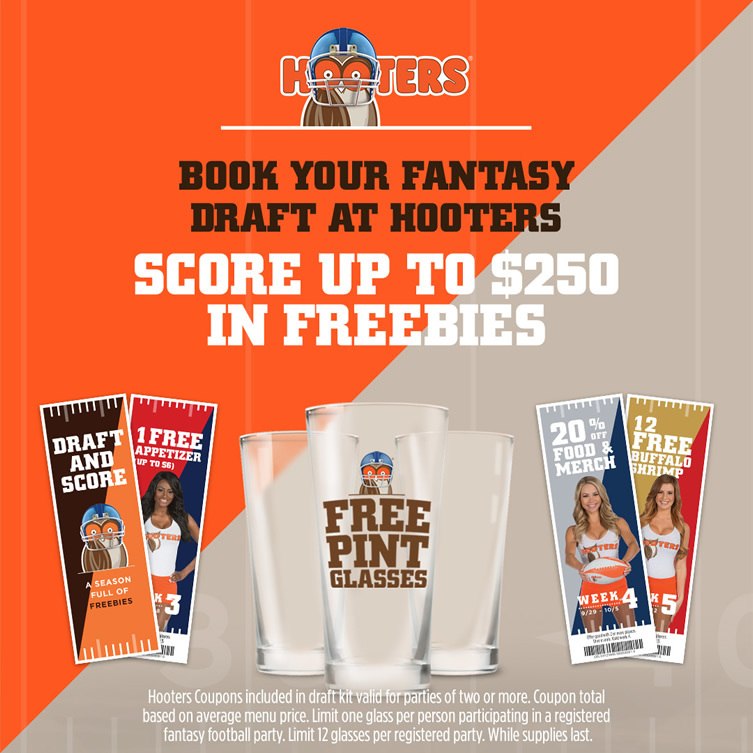 Each league receives reserved seating at their favorite Hooters along with a free draft kit complete with up to $250 in Hooters freebies, including 17 weeks of Hooters coupons, free football pint glasses and additional gear. When leagues show up on draft night they’ll even be entered to win a trip to the 2017 pro football draft or the college football championship. Draft Kit and Swag: The official Bleacher Report draft kit, available while supplies last, includes necessities like cheat sheets, a draft board, player stickers, koozies, coasters and more. 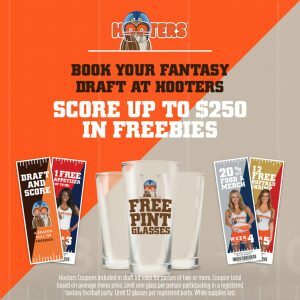 $200 in Hooters Coupons: Hosting your draft party at Hooters unlocks a season full of Hooters freebies worth up to $200, including deals like free wings, appetizers and other exclusive offers on food and merchandise. Free Pint Glass: Each member of the Hooters fantasy football draft party will score a free, limited edition football pint glass at participating locations, up to 12 glasses per party. Chance to Win Trips: This season, Hooters is unlocking exclusive experiences at some of the biggest events in football, including a grand prize trip for 12 to the 82nd annual 2017 professional football draft or a trip for two to the college football championship game in Tampa, Florida. For official rules, visit hooters.com/football/rules. Leagues are invited to share their VIP Hooters draft experience using #HootersDraftParty on social media. Hooters is also airing a series of commercials that will relate to any fantasy football player with the all-too-familiar woes that leagues face when making drafting decisions. Created by Atlanta-based The Morrison Agency, the ads “Confessions” and “The New Guy” will appear in major markets across the country with alternatives featured on the Hooters YouTube channel. Women are the fastest-growing demographic of professional football fans, representing more than 45 percent of viewers; and according to the Fantasy Sports Trade Association, women constituted a third of fantasy football managers last year. Hooters latest spot “The New Guy” taps into to that growing fan base by showcasing a table of women dishing about two men: “Tom” and “Aaron.” The spot reveals that they are actually debating quarterbacks for their fantasy league when they select a pick who is validated by both Coach Jon Gruden and their Hooters Girl, Amanda Steinbecker from Fairview Heights, Illinois. To book a fantasy football draft party at Hooters now through September 7, visit hooters.com/football. Draft kits and freebies are available at participating locations while supplies last. To find your nearest Hooters location, visit hooters.com.